Since supervisors are typically doing a job as well as managing others doing that job, it is important supervisory assessments are based on the specific needs of the supervisory position. We offer a supervisory assessment for nearly every job in the Harrison Assessment Library - a total of over 600 supervisory assessments. The Supervisory tests in the Assessment Library are based on job performance research and measure job specific success behaviours as well as qualifications (optional). Each assessment can be used for assessing applicants or developing behavioural competencies related to the specific position. Our SmartQuestionnaire measures 175 factors in only 25 minutes collecting the data necessary for a wide range of supervisory assessments. 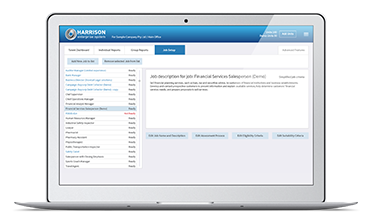 Harrison makes it easy to customize supervisory tests to your specific needs. Our assessment library provides an easy starting point which is based on our world-wide performance research. Our job analyst experts are on hand to help. Harrison uses artificial intelligence research to determine the exact factors for supervisory success in your specific positions. Our benchmarking technology identifies key success factors and derailers. It automatically generates a complete supervisory test based on the success factors. We provide a comprehensive research report which includes the exact descriptions of your success factors, correlation coefficients for each factor, and the overall correlation coefficient for the assessment against your sample of employees. The retention of supervisory talent is one of the keys to an organization's success. That's why our supervisory assessments map the candidate's or employee's needs as well as compare them to your success factors. 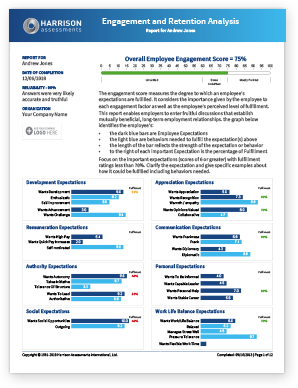 Consequently, our supervisory assessments predict engagement and retention while providing a great candidate experience. Assess mutual needs and increase retention of your supervisory talent.